Some Keynesians might object that it’s also a demand problem; after all, Iceland went through a severe financial collapse, one of the worse in world history. All the major banks failed, with liabilities totaling 1200% of GDP. The housing industry collapsed. Surely that points to a decline in AD? Actually no. Those Vikings wouldn’t have been able to survive in that harsh climate without having some smarts. Unlike the foolish Irish, the Icelanders decided to let the big banks fail and have the creditors pick up the tab, not the taxpayers. To prevent a fall in AD, they sharply depreciated the kroner. I had trouble finding NGDP data, but if you look at the graph halfway down this link, you’ll see Icelandic NGDP rose continually through the worst of the 2008 crisis, and has continued to move gradually higher. In contrast, Irish NGDP has plunged. 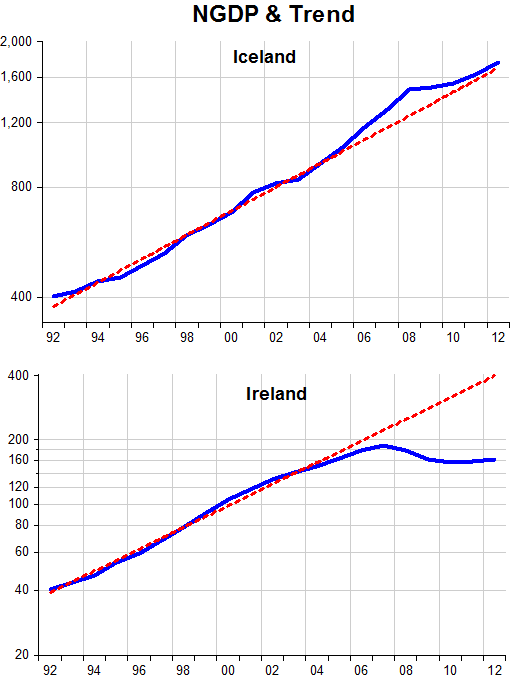 Ireland lacks the nominal income to repay its euro debts, and even to pay euro wages without steep wage cuts. 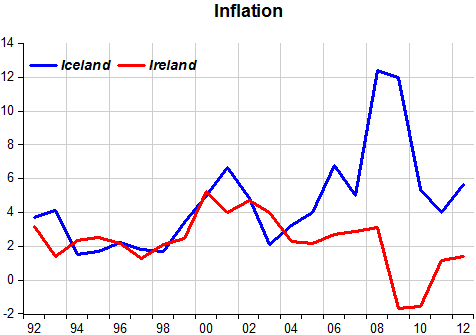 Ireland faces both recalculation and a severe demand shock. 2. It’s not even clear what the new patterns of specialization and trade should look like. Iceland is groping in the dark (literally, during these winter months) for new industries. In that case Ireland and the Baltics might see RGDP declines as big or bigger than Iceland, even though their real shocks were smaller. And this is what happened. In other words, monetary policy did not slow the process of recalculation in Iceland. In the other crisis countries monetary policy took a bad situation and made it even worse. Unemployed workers in overbuilt sectors were not able to find jobs in other sectors, as total demand was falling. Below, the argument in pictures. All in all, the outcome is a reflection of the fact that nominal spending in Iceland never dropped below trend, converging on it from above (in which case spending growth just slows down for a while). In a sense, Iceland was ‘lucky’ because just prior to the onset of the crisis monetary policy had been “too easy”. But not being in the euro ‘straightjacket’ allowed Iceland to depreciate when the crisis hit, facilitating the adjustment. This is a non sequitur. Nothing that was said prior justifies the use of “In other words” here. Slowing the process of recalculation cannot be observed through temporal trends in output. Recalculation is a counter-factual concept. The proper use of this concept would be to ask whether or not and to what extent did monetary policy in Iceland prevent unsound businesses from being liquidated. 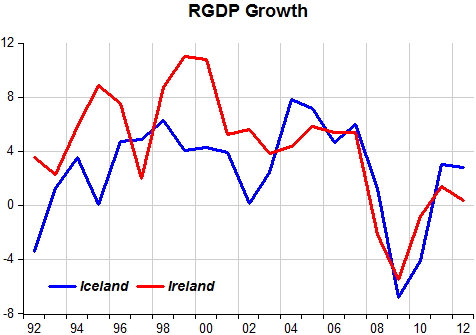 This of course would mean we should see a smaller output decline in Iceland, during and after the crisis. And that’s just what we saw. Output did indeed fall by less in Iceland, which is perfectly consistent with the theory that inflation hampers recalculation. 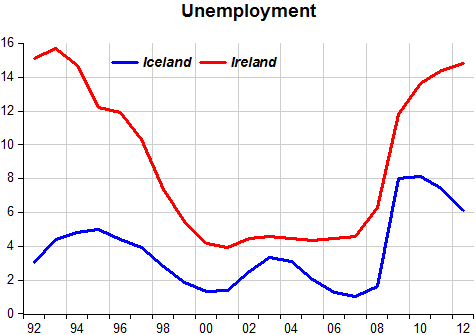 Ireland vs Iceland is maybe the ultimate test case for the euro project. If such a small, isolated land can soldier through a historically rough financial crisis, with nothing but a high omega-3 diet and monetary sovereignty, why does the euro exist at all? Why on earth would the Baltic states want to join the Euro Zone? JP, The Euro (and EU) is a political project. The Baltic states would feel more secure. After all, Russia is still their neighbor!